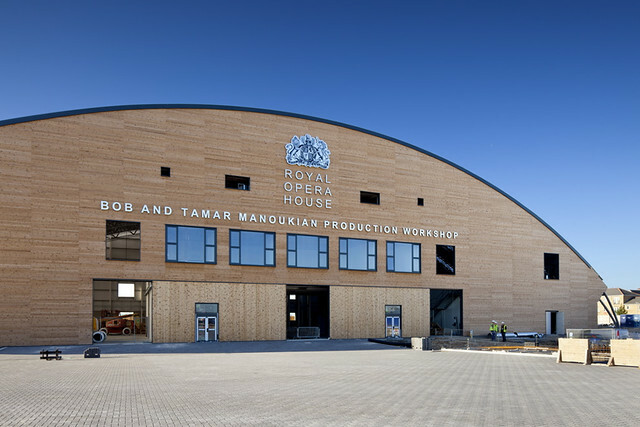 In 2010, the gates of the brand new, state-of-the-art, Royal Opera House Production Park will open on a 14-acre site at High House Farm, Purfleet, Thurrock. Located within Thames Gateway, Europe’s largest regeneration area, this exciting development will transform the local area and bring new opportunities for the people of Thurrock. As the UK’s first ever national centre of excellence for technical skills, crafts and production for the performing arts and live music industries, the ROH Production Park will be a unique and valued resource. It will house a world-class production facility for the Royal Opera House and the new National Skills Academy for Creative & Cultural Skills, as well as workspaces for creative enterprises. Community, education, exhibition and meeting spaces will be located in the restored Grade II listed High House Farm buildings that are at the heart of the development. This unique combination will make the ROH Production Park a magnet for related companies, organisations and talented individuals. It will act as a focus and catalyst for the skills that it hosts by providing training, education, business and community spaces and much needed regeneration and opportunities for the local area. The ROH Production Park will be built with quality and environmental sustainability as key considerations. The previously neglected Grade II listed farm buildings of High House will be restored to their former glory and returned to daily use. Features including a one acre walled garden and play space will provide a fantastic environment for workers, visitors and local people to enjoy. The ROH Production Park is a unique partnership between Arts Council England, Creative & Cultural Skills, the East of England Development Agency, Royal Opera House, Thurrock Council and the Thurrock Thames Gateway Development Corporation.